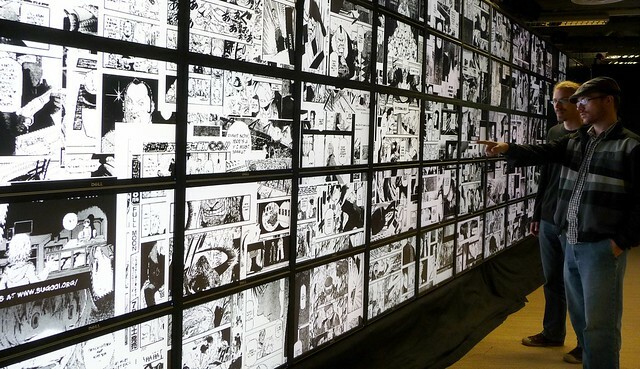 Exploring a visualization of 1 million manga pages on 287 megapixel HIperSpace visualization system at Calit2, 2010. CUNY (City University of New York) Graduate Center, 365 5th Avenue, New York City. Want to visit the course and sit in on particular meetings? It is possible but please email me first [manovich dot lev at gmail dot com]. Classes meet on Mondays, 2pm-4pm. Room: 3309. First class meeting: Monday, January 28. Schedule, lectures, readings, tutorials, resources (will be updated during the semester). Use the #digitalgc hashtag on twitter and blog posts. Arienne Dwyer - MALS 75500 – Digital Humanities: Methods and Practices - Mondays, 11:45 a.m.-1:45 p.m. The explosive growth of social media on the web, combined with the digitization of cultural artifacts by libraries and museums opens up exiting new possibilities for the study of cultural processes. For the first time, we have access to massive amounts of cultural data from both the past and the present. How do we navigate and interact with massive cultural collections (billions of objects)? How do we combine close reading of individual artifacts and “distant reading” of patterns across millions of these artifacts? What visualization and computational tools are particularly suited for working with large cultural data sets? How do we use exploratory visualization as a research method in the humanities and social science? How to understand visualization theoretically in relation to other visual media, past and present? We will also discuss cultural, social and technical developments that placed "information" and "data" in the center of contemporary social and economic life (the concepts of information society, network society, software society). We will critically examine the fundamental paradigms developed by modern societies to analyze patterns in data - statistics, visualization, data mining. This will help us to employ computational tools more reflexively. At the same time, the practical work with these tools will help us to better understand how they are used in society at large - the modes of thinking they enable, their strengths and weaknesses, the often unexamined assumptions behind their use. Finally, we also want to ask general questions about theory and art in a "postdigital" society. What new theoretical concepts and models we need to deal with the new scale of born-digital culture? The course is suitable for students from any area of humanities or social sciences. No technical skills are required beyond the basic digital media literacy. Because I expect people from a variety of backgrounds, I wll not go deeply into statistics, data analytics, and data mining. As examples of what we will cover, I will explain PCA, and show how to do it in R; I will also talk about the concepts of "features" and "features space" and show examples of features for text, sound, image, and spatial data. I will demo data analysis and visualization tools, and demonstrate their use in class. However, there wil be no required technical assignments. (Given variety of student backgrounds, such assingmemnts will likely to be too simple for some and too challenging for others.) You are strongly encouraged to try the tools and the techniques shown in class outside of the class meetings, and use them in your practical course projects. I will provide simple data sets and exerises you should work on if you want to learn these tools. As my own research focuses on analysis and visualization of images, video, and interactive media, visual media be the focus of demos and examples. We will learn about Image Processing, how to extract features from images and visualize image and video collections. (I will not be giving a comprehensive overview of all DH tools people use to work with texts, maps, or historical data - but we will cover basic concepts). A typical "large cultural data analysis" project involves three parts: data, analysis/visualization, interface. Each concept will be discused in relation to current industry approaches, relevant projects the arts and design (historical and recent), media and software studies theory, and practical techniques and tools. Students will have a choice of doing the following: a final paper, a series of blog posts examining concepts or presenting a project; a practical project which can be done individually or in a collaboration with other students. If you want the course to cover particular topics, or have suggestions for particular readings, please leave a comment here.